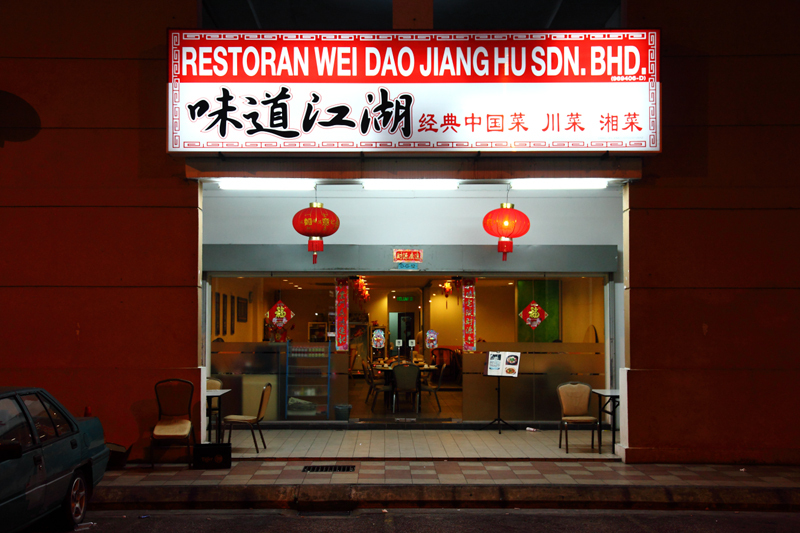 Wei Dao Jiang Hu is a Chinese restaurant at Kepong that specializes in Szechuan and Hunan cuisine, both known for their hot and spicy flavour. The menu here is quite extensive and it’d take you at least a dozen of visits to try everything. Price wise I guess it’s fairly reasonable considering the portions – but might not be affordable enough for frequent visits. 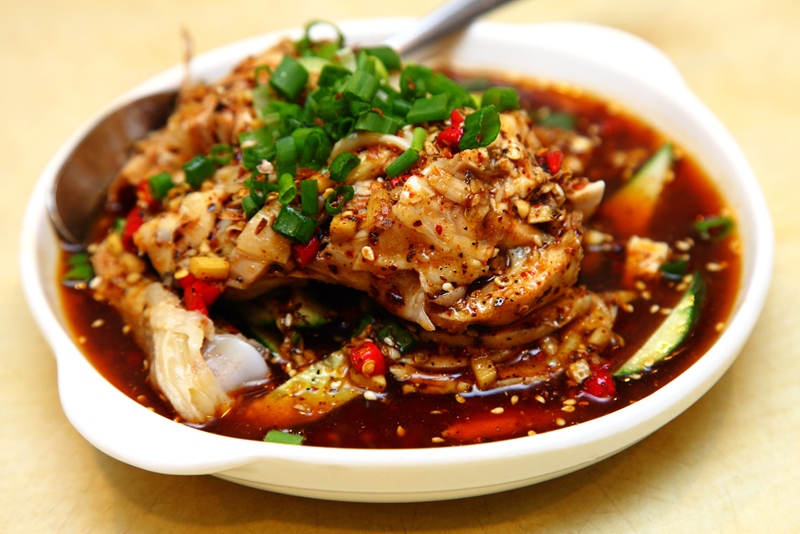 The 口水鸡 (Drool-Worthy Chicken) @ RM16 is essentially a cold dish of poached chicken in spicy chili oil. The story behind this dish’s peculiar name came about from a story where a famous person saw at this dish and thought it was so appetizing that he claimed it made him salivate hungrily. Well, I am pretty sure he did not see the one we had. As you can see, the chicken is like “swimming” in a pool of chilli oil so the spiciness is no joke. But there’s also a hint of sourness that adds an appetizing touch to it – making it not so one-dimensional tasting. 水煮肉片 (Water-Boiled Pork Slices) @ RM26 is exactly like how it sounds. The pork slices are poached to the right doneness to preserve the meat’s tenderness for the perfect bite. 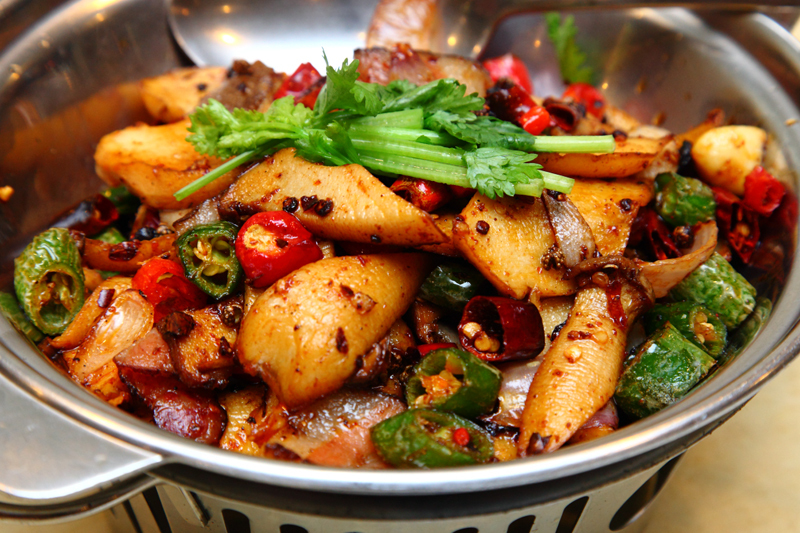 Liberal use of chilli peppers and Szechuan peppercorn gives this dish a bold and spicy flavour. If you happen to bite into one of the peppercorns (which you should be avoiding), be prepared for a numbing sensation on your lips and tongue. 干锅杏鲍菇 (Grilled Oyster Mushroom) @ RM20 – tastes pretty much the same with similar level of spiciness. Slices of pork bacon are also thrown in for an extra smokey and sweet flavour. 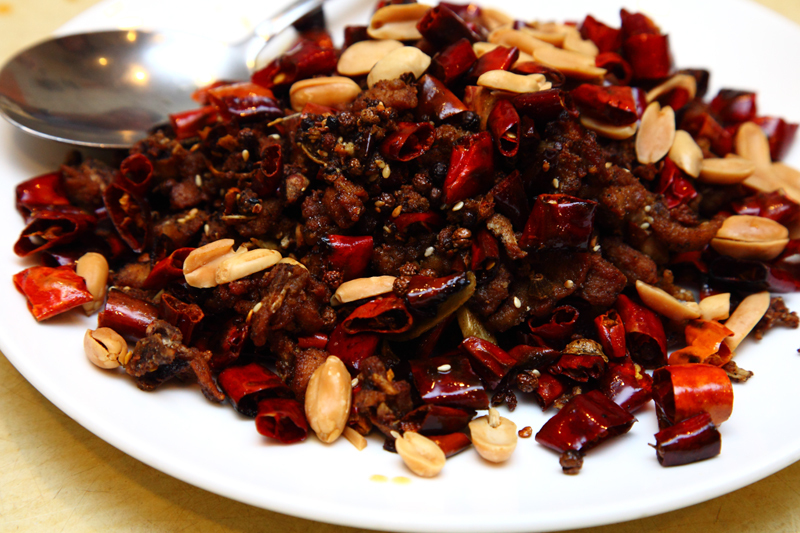 重庆辣子鸡 (Chong Qing Spicy Diced Chicken) @ RM28 – basically a stir-fried marinated chicken dish wih loads of chilli peppers. It’s spicy and salty, great to have with rice, but the chicken pieces are chopped with the bones intact which I find a bit annoying to enjoy properly. 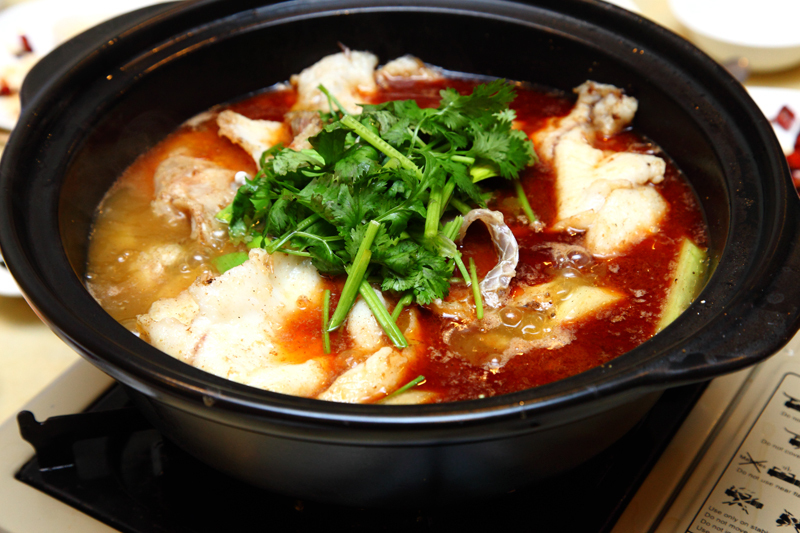 Among the handful of dishes we tried, I feel the 砂锅金凤 (Claypot Tilapia) @ RM42 was the nicest. 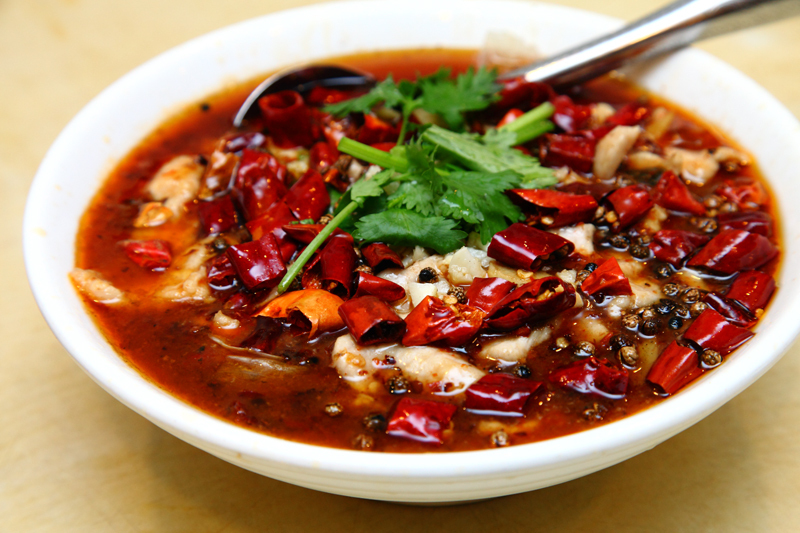 The seasoning of the soup is balanced, mildy spicy yet soothing due to the fragrant herbs used. The fish itself tasted fresh and was perfectly cooked with a delicious texture. Since the portion is so large (they gave a pretty large fish), it can be easily shared among 5-6 people. All in all, even though I am not a huge fan of Szechuan cuisine, the food’s generally OK if you could handle these uniquely spicy and numbing flavours. The spiciness is not something we locals are used to taste like those in spicy pan mee, sambal or ayam penyet. It’s in a class of its own – which some might find great, or off-putting.